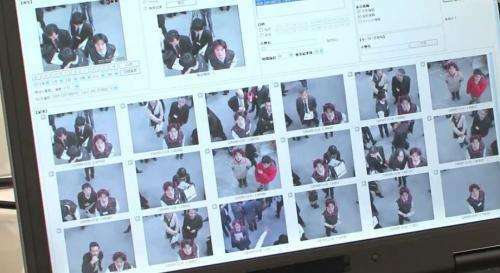 (PhysOrg.com) -- A new surveillance camera by Hitachi Kokusai Electric can look at footage that contains an image of someone, either still or video, and then search other video or still images on file for other instances of that same face. In so doing, it can search, process and display up to thirty six million faces in just one second. Each hit is displayed immediately in its native format, i.e. still or video, in thumbnail form, which its makers say, allows the camera to display the actions of a person prior to, or even after, being seen by the surveillance camera. All they need do is click on the thumbnail to watch the video play. As one example, if a person walks into a convenience store and robs the cashier, if his or face is captured by a video camera, police could use that imagery to search for that same face in prior video recorded by the store to see if that person has been to the store before, and if so, if they left any clues as to who they might be, by say, using a credit card to pay for purchase. Similarly, the same face could be searched in a much larger database of still or video that the police have stockpiled from surveillance cameras from other places, allowing them to see, almost instantly, if that person has been caught on tape at any other point in time doing anything that might help lead to an arrest, such as trying to pawn stolen merchandise. Perhaps more interestingly, the system can be used to scan for that face in a large crowd. It will look at each individual face in every scene in a video for a match. Representatives from Hitachi say the system works by using image recognition software combined with algorithms that group people who have similar faces. Currently, those in the surveillance business have to sift through video by actually watching it all to try to identify someone they suspect might have appeared in another video. This new system, its makers say, should be of great interest to mass transit authorities, police and store owners, particularly those that run large ones that have a lot of people coming and going. They also say that they expect to deliver a finished product next fiscal year, which means organizations that are interested, can start booking orders almost right away. Amazing system! Douple plus good even! Big Brother gets faster and smarter. Surely this will help bigbrother stop all crimethinkers. This is doubleplus good! lo and behold: the arrival of the big-brother! This would be a great way to verify voters only vote once by collecting a video/still DB at the polls during identification (w/o picture ID) and then verifying that the same face had not already voted. The video/stills are shared to a temporary server that each polling station has access to. It could also be run against the picture DB for drivers as a back-up ID w/o requiring the voter to produce an ID. In this second case, this only shows the voter has a picture and is not ID required to be a voter. For example, if someone were to protest Sharia law being passed in the USA, the NWO authorities can find them no matter where they hid.